Sunway College, one of the pioneer twinning programmes providers in Malaysia offers a curriculum identical to VU Melbourne, Australia. One of the ways of assuring Sunway College provides a true Australian learning experience is via the Burst Mode or Block Teaching, whereby academic staff from VU Australia visit to teach the students and exchange ideas on their teaching experience with the academic team on the VU Bachelor of Business programme at Sunway College every semester. Recently, Kathy Michael, Steven Wdowik and Dr Maxwell Winchester from VU Melbourne visited Sunway College for their block teaching stint. In addition to teaching their respective subjects, they were here to ensure the quality of the VU programme delivery standards, to plan and implement the latest teaching strategies and methodologies at Sunway College which had already been tested and delivered in Australia. Michael and Wdowik from Victoria University’s School of Accounting and Finance are teaching Management Accounting and Credit & Lending Decisions respectively. They introduced and rolled out the “virtual office hours” at Sunway College. Office hours refers to the time when students can consult with lecturers outside lectures and tutorials. The virtual office hours is an innovative programme introduced by the Victoria University Accounting Faculty to engage international offshore students in virtual classrooms. It accommodates multiple learning styles through the use of web, audio, video, instant messaging, shared interactive whiteboard and social networking. Dr Winchester, Discipline Leader of the Bachelor of Business (Marketing) on the other hand was here to teach a Marketing module and to discuss with Greeja Hemalata De Silva, Sunway College’s Head of the VU Bachelor of Business Programme, the plan of moving away from the conventional delivery model of Marketing modules from the current 2-hour lecture and 1-hour tutorial into a 3-hour seminar. “Seminars are directed at a much smaller group than lectures but at a bigger group than tutorials, ideally with about 40 to 50 students in a group. The benefits of running seminars within a 3 hour duration is that - when we have covered a lecture topic, and rather than testing their understanding in tutorials the following week, the students will now get to stop and immediately reflect on that topic. This provides the students with the opportunity to discuss, question and do a case study on the topic. We have been practising this in the Marketing units in Melbourne and we found that students’ learning experience is enhanced, with a higher retention of learning content, a better attendance rate and an improved relationship between lecturers and students,” said Dr Winchester with great passion. With experience encompassing more than 25 years in teaching, he believes that the greatest reward of teaching is watching students grow and making a difference in their lives. The block teaching visits have been proven to be effective in assuring that the syllabi, assignments, tests and examinations are identical to that of VU Melbourne. By studying locally, Malaysians can also enjoy a substantial cost savings in acquiring a reputable Australian degree, without having to leave home. Victoria University, established in 1916, is a highly respected, multi-disciplinary university based in Melbourne, Australia. 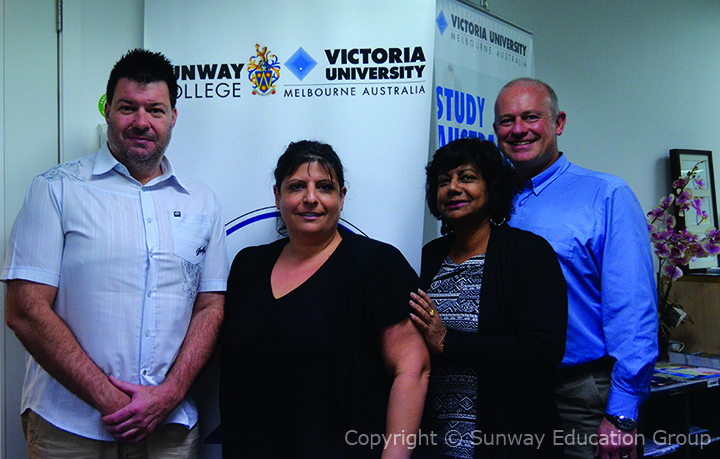 VU Melbourne’s partnership with Sunway College is the longest, largest and most stable amongst all its international partnerships. You know how VU Melbourne performance has always been far ahead of its competition? The way you could just tell that internally, VU Melbourne had uncompromising standards for how responsive these things needed to be? Virtual Framework is used now-a-days on high pace, such as virtual reality, virtual offices and now this concept of virtual working hours in college is amazing to increase the performance in this competitive era.